Earlier this week, I posted a video interview of Rob Bell, conducted by Martin Bashir from MSNBC. Apparently some have complained that Bashir’s interview tactics were in some way unfair. I have not heard or read those complaints, but it does not take much imagination to figure out who might be levelling them. In any case, Bashir agreed to be interviewed by a Detroit radio host yesterday, I believe. In that interview, Bashir gives some excellent background on how and why he conducted the interview as he did. Hear it in his own voice. A little long, but enlightening nevertheless. Witness, the art of asking, and not answering questions. Martin Bashir has scored some big interviews in the course of his career. His interview of the stranger-than-strange late Michael Jackson around the time of the investigations of Jackson’s perverted relationships with young boys, is a case in point. Among Bashir’s interviews I have seen, he seems to NOT shy away from tough questions that really demand honest answers, and attempts to evade become extraordinarily obvious. Such is the case in this interview that Bashir conducts with Rob Bell about his new book Love Wins. For those who know me, it will come as no surprise to you that I am no fan of Rob Bell. In fact, I think it is a settled fact, based on his preaching, and writings that he teaches a gospel that bears very little if any resemblance to the Gospel of Jesus Christ found in the Christian scriptures. Case in point would be his apparent belief in universalism, the notion that through some means, not spoken of in the Bible, all, no make that ALL people will wind up in heaven. While I suppose there is a certain appeal to that sort of belief system, it would seem that if also falls well outside the bounds of historically orthodox Christian doctrine. Click HERE to watch the video touting his upcoming book. 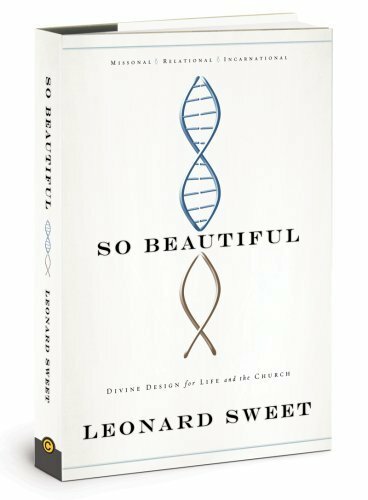 So Beautiful, written by Leonard Sweet is a book that I simply cannot recommend. It is that void of anything helpful or commendable. Let me correct that, for anyone who feels a need to read the latest in worn-out, tired, ever so slightly re-cast, and generally only warmed-over, “emergent” arguments against what Sweet and others of his ilk would refer to as the ‘traditional church’, this might be worth your time and effort, although there are probably far better books from far better known authors to choose from. Sweet is a seminary professor and ordained United Methodist elder who would, I am relatively certain, not object to the label “deconstructionist” with respect to his ecclesiology (see page 39 if you are so compelled). From his writing, one might also conclude that he is at least a borderline heretic based on at least a section of his writing. In one particular section, using a computer as the analogy, he suggests that “Version 1.0 is known as the First Testament; Version 2.0 is known as the New Testament; Version 3.0 (the essence of what he is proposing in the book as an alternative to the way the church functions today) is the Third Testament, the Gospel According to … you.” Perhaps I am being thin-skinned, but there is no Gospel according to me. There is only the Gospel according to the inspired human authors whose work has been memorialized for the last 2,000 years in the Canon of scripture. Not a great deal more needs to be said about this book apart from ‘don’t read it.’ But to the extent you are influenced by the blurbs written in support of a book, you might be interested to know that both Tony Campolo and Tony Jones LOVE this book. Enough said? Yeah. Rob Bell, the man that the Chicago Sun Times has referred to as the “heir to Billy Graham” was interviewed for an article that appeared in the April 22, 2009 issue of Christianity Today. Oh boy. And this man apparently has credibility in some quarters. As I was reading the CT interview, I wondered what is militant mysticism? If it is anything like miltant Islamists, militant feminists, militant right-wing extremists, militant homosexuals or essentially any other noun I can think of, modified by the term “militant,” I’m relatively certain I don’t want to have anything to do with it. I am not even sure that the term “militant Christian” would be all that flattering. In fact, I’ll correct that, it is NOT flattering. The second quote sounds like it might have come from Alice in Wonderland or perhaps some confessional mantra from an eastern religion of enlightenment. As for the third, the context for this quote is his lamentation over the violence in our culture. So, am I to take it that he is okay with his father getting death threats, so long as there are bodyguards? With respect to that forth quote, well, I think it speaks for itself. Here is a man who is pastor of a sort-of Christian church, yet he evidently is bewildered or perhaps even offended by a Christian praying at the inauguration of the President. But if you think those were strange, here is Rob Bell’s summary of the Gospel of Jesus Christ. Welcome to the new and improved Christ-less Christianity,…Rob Bell Style. No perfect Creator, no disobedience by man, no judgment, no substitutionary atonement, no redemption, no regeneration, no eternity. No worries! Just tiny little slivers! And my response…Come, Lord Jesus! Why We’re Not Emergent (By Two Guys Who Should Be)by Kevin DeYoung and Ted Kluck, is a terrific book. For anyone interested in learning more about the now not-so-new stream in the contemporary Christian church, often referred to as “emerging” or “emergent”, this is a great place to get informed. Kevin DeYoung and Ted Kluck are friends in real life, and both worship at the same church; a church that serves the community around Michigan State University in East Lansing, MI. A community that would clearly be defined as a target audience for the “emergent church.” DeYoung is the senior pastor and Kluck a member of University Reformed Church. The two essentially alternate the authorship of the chapters of the book, 11 of them in all, plus an epilogue. As Kluck notes in the section of the Introduction to the book that he wrote, DeYoung’s chapters are longer and more propositional, while his are shorter and more “experiential” because he is not a seminary-trained theologian (as is DeYoung), rather, he is just a guy in the pew, (or as he says in his case, in the plastic chair). This characterization proves incredibly accurate. DeYoung’s chapters really are theologically deep. He uses quotations from many of the major figures in the “emergent” church and the ending of his chapters often have dozens of references to the sources that he cites. I found his technique to be quite effective, as he uses the “emergent” leaders’ own words to implicate and indict. And his well informed and insightful commentary served to drive home the points he is making. DeYoung’s chapters left me feeling truly enlightened. Kluck may try to self-efface in the Intro to the book, but he is himself a professional writer, so his chapters do not suffer from having “just been written by some guy in the pew (or plastic chair). He uses a kind of critical cynicism about the “emergent” movement, that is not unkind, or hateful, but makes the points very effectively, and with good humor. It was a fun combination with DeYoung’s writing, and his chapters read very quickly. This book is a keeper. It is not for the casual reader, but it will be helpful to anyone who doesn’t mind wading into the theology of this stream and the arguments against it. You can read more of, and about Kevin DeYoung at his blog, DeYoung Restless and Reformed. Hmmm, an interesting way of describing it. A very perceptive article by Kevin DeYoung, a pastor who lives in East Lansing, Michigan, and who’s church is highly accessible to students at Michigan State University. He has a handle on that generation, and the varying forms of worship that appeal to it. He has also co-authored a book about the Emergent church movement. The article though captures a concept that is trans-generational. Just out of curiosity, of my handful of readers, how would you categorize yourself? Take the poll below. You are currently browsing the archives for the Emergent stuff category.